Easter Egg Hunt: The annual Easter Egg Hunt will be held on Sun., April 21. A Continental Breakfast will be served in the Church Social Hall starting at 9:30am. 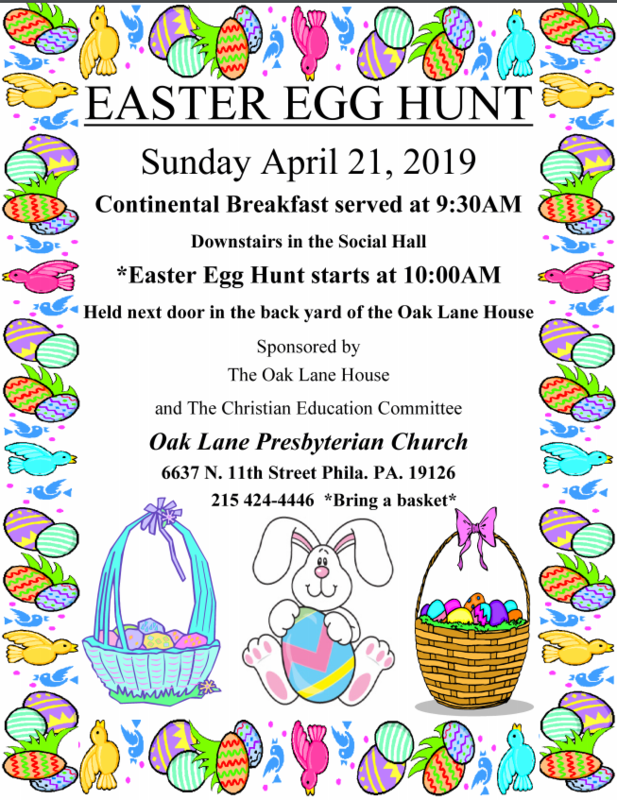 The Easter Egg Hunt will start at 10am in the back yard of The Oak Lane House next to the Church on 11th St. KIDS, BRING YOU OWN BASKETS. The event is being sponsored by the Christian Education Committee and The Oak Lane House. It was the year 1815, and the British, under Wellington’s leadership, were about to meet Napoleon at Waterloo. Napoleon had marched right across Europe…and anyone who had gotten in his way! He seemed almost inhuman, undefeatable. The future of England – and the entire world, for that matter – hung in the balance. And so it was that England anxiously awaited news of the outcome of the monumental battle. The people hung breathlessly on every letter. Just then a thick fog began to settle over the Channel. “Wellington defeated?” Oh, God, no! Gloom and despair spread across the nation. All was lost! As we celebrate Easter this year, let us remember both the price that was paid for us and the victory that is won for us. Alleluia! Christ is risen indeed and in deed!